Our 6th-8th Grade Students Have Great Taste! On Thursday, our 6th, 7th, and 8th graders got to treat themselves - to some nutritious, tasty food! 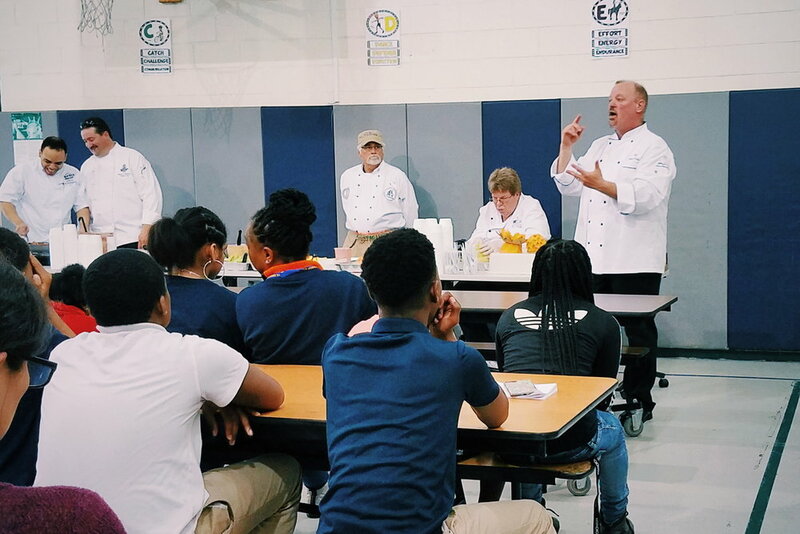 Members of the Professional Chefs Association of South Jersey paid the students a visit on April 18th to talk to them about eating healthily, and about the paths one can take to become a professional cook or chef. The PCASJ is our local chapter of the American Culinary Federation, dedicated to education and humanitarian efforts. Chefs Mike, Ed, George, Guy, and Keith brought an assortment of raw fruits and vegetables, as well as whole wheat pasta and tomato sauce, for students to snack on after their presentation. After telling them about the foods they’d brought, the chefs stressed to the students the importance of choosing to eat “clean,” non-processed, and fresh foods as often as possible. Everyone (even the chefs) agreed that fried food can taste good. But the chefs made a point to encourage other healthier methods of cooking, like baking or steaming, that can be just as delicious while keeping the food’s nutrients in tact. A handful of students raised their hands when asked if anybody hoped to become a professional cook or chef someday. The chefs provided the students with many words of wisdom, but always returned to the fact that gaining firsthand experience is crucial to becoming a pro at anything. The five chefs had over 200 years of cooking experience among them, working at establishments such as the Taj Mahal Casino, the Hard Rock Hotel & Casino, and The Flanders Hotel. Students asked them a great deal of questions, ranging from how they got their start and what inspired them to become chefs to which famous people they’ve cooked for (the kids loved when Chef Mike added that he’d personally cooked for Drake). At the conclusion, everybody received their share of fruits, vegetables, and pasta, while some chefs spoke to students individually about their prospective futures in the culinary arts. Everyone could tell that the chefs loved sharing their knowledge and experience, as well as their food, with the younger generation. Our scholars in grades K through 2 really stuck to their reading this month. For the month of March, we will be celebrating Dr. Seuss’ Birthday, or Read Across America. We know how important it is to read every day and we would like to celebrate those students who do! This month we will have a special reading log. If your child reads every day and fills in the whole reading log they will participate in our “Stuck On Reading” challenge with Principal Cetrullo. Mr. Cetrullo will read a few of his favorite books while students place a piece of duct tape on him. After all of the pieces of tape are on him, we will see if he is stuck to the wall! We need enough duct tape to hold him up, so make sure to read every day! And by “stuck on reading,” we mean literally stuck - to the wall! This was a great way to wrap up Read Across America, and to let students celebrate their reading goals. Thank you, families, for encouraging your scholars to read! Join us in celebrating Autism Awareness Month on the week of April 1st! 8th grade scholar, Gabriella Westcott, is the first from her class to be admitted into Atlantic County Institute of Technology, ACIT. Friday night, as she was getting an early start on her homework, Gabby’s father approached her saying he had good news- she was admitted to her top choice for high school! “I threw my papers up in the air and started dancing around the kitchen,” the eager, almost graduate, admitted. Congrats, Gabby! We can’t wait to see all the amazing things you accomplish! Gabriella Westcott, now in 8th grade (left) & her first year at ACCS in 6th grade (right). We are so proud of our scholar, Harmanpreet Kaur, who earned an interview for a Summer STEM Scholarship at Stockton University! On Friday February 18, 2019 we had Wincey Co. come in to do a Black History Month show for our scholars! Wincey Co. is an entertainment group specializing in education in the state of New Jersey, with an emphasis on musical assembly series for schools. Learn More about Wincey Co.
Read Across America 2019 Week Events! Start prepping now! Have your scholar take the NJSLA PRACTICE TEST online! Who knew Saturday Test Prep could sound so fun?! 100th Day of School Parade! ACCS Wins School Choice Week's Leadership Award! PTO Meeting to Celebrate National School Choice Week! ACCS PTO poses during our PTO meeting to celebrate National School Choice Week! It starts this January 21 and scholars have already begun academic activities related to the event! Scholars proudly stand next to the new bicycle and tricycle they just won with their “Caught You Being Good” incentive coupons. “Caught you being good” is a school wide positive incentive program where students are “caught” doing the right thing by staff members and rewarded by earning various incentives from bicycles to ACCS sweat suits. Coupons are also counted by homerooms which compete for the top earners of each marking period. The winning homeroom is rewarded with a pizza lunch. Mrs. Cummins’ 4th grade class won for the first marking period. Great work by all! 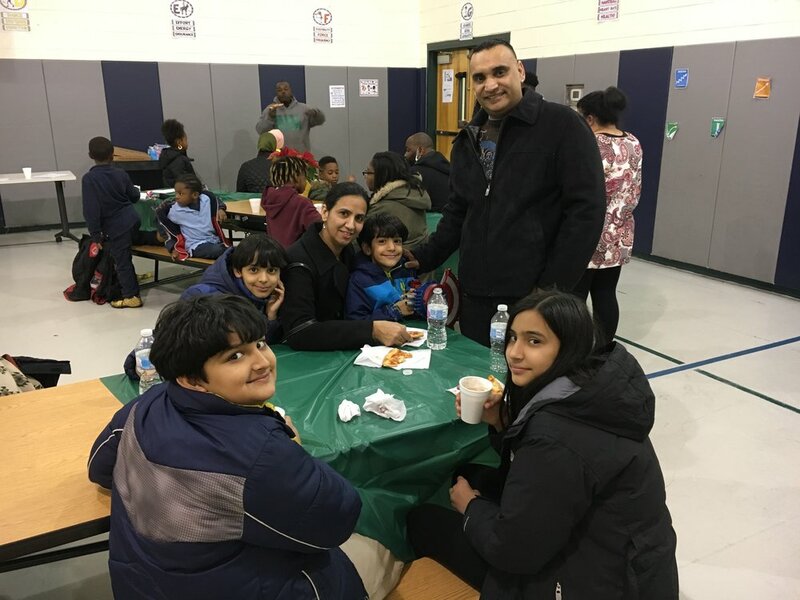 The ACCS Book Fair Family Night was held Thursday, December 13th. 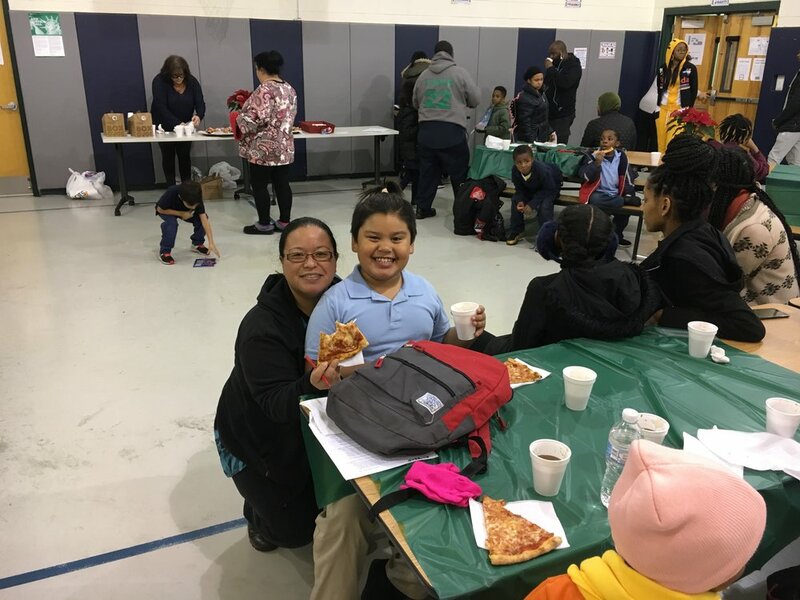 Families had the opportunity to warm up with a good book, knit hats and gloves, hot pizza, hot chocolate, and sweets. ACCS students moved to the next round in Millville for the ELKS Hoop Shoot contest on Saturday, 12.8.18. ACCS students wrote cards to the Coast Guard in Alaska thanking them for their service! Teacher Sarah Pepe initiated the event.